More than a million cases of urolithiasis occur each year in the United States. Renal stones are one of the most painful disorders that a human can experience, and indeed have been known for centuries. Stones have been found in 7000-year-old Egyptian mummies. The management of calculous disease has changed with the advent of extra-corporeal shock wave lithotripsy, percutaneous nephrolithotripsy, ureteroscopy with use of different fragmentation devices, and, recently, laparoscopy in the armamentarium of urologist (1). The natural corollary of technical development has been the steady decline of open surgery in the management of stone disease. However, despite ever-expanding indications, the new technologies have not been able to completely replace open surgery (2). On the contrary, there still exist some situations where open surgery may be the treatment of choice. This is not to say that open surgery is the "only option" but probably the "most suitable option" and in order to avoid considering open surgery as a salvage procedure only, it is important to critically evaluate these cases of calculous disease for potential management with laparoscopic surgery (3). Although laparoscopic removal of stones from kidney, ureter, and bladder can be performed by the transperitoneal or extraperitoneal approach, the latter approach may have certain advantages. The primary advantages of retroperitoneoscopy in calculous disease are rapid access to the diseased retroperitoneal organ and avoidance of urine spillage (which can vary from mild infection to frank pus) into the peritoneal cavity. reported on laparoscopic management of calculous disease including ureterolithotomy (3,5-9), pyelolithotomy (10-14) nephrectomy and nephroureterectomy (12,15), and anat-rophic nephrolithotomy (16). Successful laparoscopic management of calculous disease can be done for a variety of indications (Table 1). The indications have not been clearly defined and may vary from center to center depending on the available expertise. Although laparoscopic removal of stones from kidney, ureter, and bladder can be performed by the transperitoneal or extraperitoneal approach, the latter approach may have certain advantages. The primary advantages of retroperitoneoscopy in calculous disease are rapid access to the diseased retroperitoneal organ and avoidance of urine spillage (which can vary from mild infection to frank pus) into the peritoneal cavity (12). Laparoscopic simple nephrectomy for the removal of nonfunctioning kidneys due to stone disease is an established procedure (15). However, the role of laparoscopic ureterolithotomy and pyelolithotomy is still controversial. To date, few comparative studies between laparoscopic and open ureterolithotomy are reported with clear advantages for the laparoscopic approach (5,17). There is only one report in the literature, comparing laparoscopic pyelolithotomy and percutaneous nephrolithotripsy (14). 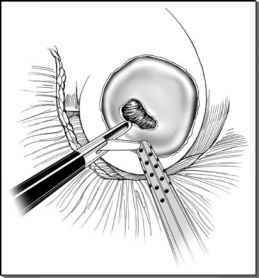 Recently, robotic assistance has also been reported for staghorn stones and in cases of pyelolithotomy with pyeloplasty in patients of uretero pelvic junction obstruction with secondary renal stones (18). Initial procedural steps such as preoperative preparation, patient position, and approach (transperitoneal vs. retroperitoneal) are almost similar for laparoscopic ureterolithotomy, pyelolithotomy, pyelolithotomy with pyeloplasty, and nephrectomy or nephroureterectomy in calculous disease. Hence, these steps have been described in common rather than separately with each procedure. The indications for laparoscopic ureterolithotomy, pyelolithotomy, pyelolithotomy with repair of uretero pelvic junction obstruction, nephrectomy, or nephroureterectomy for calculous disease are similar to that for open surgery. The indications for laparoscopic nephrectomy or nephroureterectomy in calculous disease are nonfunctioning kidneys due to renal stones, ureteric stones, megaureter with secondary stones, and uretero pelvic junction obstruction with stones.